Am I the only one who’s noticed the return of regular, stainless steel knives to airplanes and airport lounges? At first, it didn’t register, then I began thinking, "What’s up? Have we officially won the war on terrorism? Are we no longer worried about terrorists using these potential weapons in nefarious ways?" And we can now tote scissors, as long as they are of the plastic handled sewing variety. So, who is responsible for this particular stroke of genius? TSA? The individual airlines? Homeland Security? Each of these entities already has enough image and reputation problems to fill one of those new Airbus 380s many times over. So, can someone please wake-up and bring back those plastic knives and reinstate the no-scissors ban. Scissors are scissors and plastic knives may not cut as well but, hey, that means they may not cut as well. Get it? Good Morning Advertising Industry. This is Your 7am Wake-up Call. 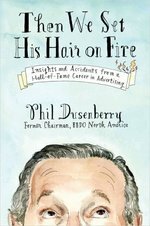 I’m in the midst of reading former BBDO Chairman Phil Dusenberry’s entertaining new book entitled, "Then We Set His Hair on Fire." The book chronicles Dusenberry’s various exploits and uber successful campaigns for the likes of Campbell’s Soup, Pepsi-Cola and the 1984 presidential campaign to re-elect Ronald Reagan. As might be expected, the book has been receiving favorable reviews in the ad trades as well as the Wall Street Journal. While it is a fun read, Dusenberry’s book reflects the still-prevalent mindset among advertising types that their craft is the be-all and end-all when it comes to reaching consumers and "moving the needle" as Phil describes it. While that may have been the case when Dusenberry was in his heyday, it simply is no longer true. The rise of technology such as Tivo, the internet, video games, and 500-plus cable channels has totally disintermediated advertising’s once unchallenged supremacy. Consumers are completely overloaded with information and choices. Gone are the days when a 30-second spot would reach a vast majority of a prospective customer audience and induce them to buy a product or service. Instead, we’ve seen the rise of word of mouth marketing, street-level events, and public relations as the best, most effective ways to reach consumers in a one-to-one, personalized way. And, yet, Stuart Elliot still writes about massive advertising expenditures in his New York Times column. And, we still see mindless and totally indistinguishable car commercials on TV featuring soundtracks from Rock’s dinosaurs (I defy anyone to watch five or six of these commercials in a row and then correctly name each car). As a matter of fact, except for the Geico and Mastercard commercials, I’d be hard-pressed to name any TV spots that actually break through and register in my personally overloaded mind. So, all I’m asking is that advertisers wake up and start spending their money in smarter, more direct ways. Dusenberry and his ad agency buddies had a great run. But, the times they are a changing. The CEO of a Fortune 500 corporation told an interesting story about a nationally-known and highly-regarded car service he’d taken to go from point A to point B. Throughout the trip, the driver complained to the CEO about the limo company, its hiring and firing practices, horrible pension program and parsimonious outlook on life in general. When he exited the car, the CEO said he vowed never to use the limo service again. I’ve had a similar experience with a major credit card company that handles our corporate account. About a year ago, we signed up for their super duper deluxe service and paid a steep annual premium for the privilege. And that’s right about the time the relationship started going South. Consider these horrific experiences: The card company’s "24×7 concierge service" told my assistant she was confused in thinking that John Wayne Airport in California was different than JFK in New York. In fact, the agent said, they were one and the same airport (the CSR must have been chewing some top-grade peyote to have come up with that one). Another CSR insisted that Irvine, California, didn’t exist (which must be a real bummer to the folks who live there). A third agent refused to book a reservation on JetBlue because the card company didn’t receive compensation from that particular carrier for doing so. The list could go on and on. Great customer service has an immediate and direct impact on an organization’s image and reputation. As mentioned in my previous columns, the greatest marketing and branding program in the world will fall flat on its face if a limo driver is trashing the company or a customer service rep is flat out incompetent. So, what are we doing about our present card company? Being forgiving types, we’ll give them one more chance. But only one. Most of us in the business world attempt to sell our products or services to others. In doing so, we try to present the best possible plan, ideas, etc. In exchange, we hope to be hired, or not. In either case, though, we expect the courtesy of a response or explanation if our services aren’t desired. I’ve noticed a truly alarming rise in plain, old bad manners when it comes to this aspect of business decorum. For example, we’ll spend countless hours researching a proposal, developing creative ideas, pulling together a massive document and shipping it off to the prospective client in advance of an agreed-upon deadline. Then we’ll wait. And wait. In one recent instance, I received an e-mail saying nothing more than "Thanks for your ideas. We’re going with another firm." In another impersonal e-mail, the CMO of a large professional services firm wrote a cursory note informing us we hadn’t advanced to the next round but offered himself for follow-up questions. I e-mailed asking for a date and time to speak. No response. Still others don’t even bother returning phone calls. My favorite example of business boorishness occurred a year or so ago when we were in the midst of a three agency pitch and were anxiously awaiting a decision. 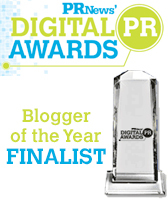 Leafing through one of our industry rags, I noticed an article announcing that a competitor had been selected. Needless to say, I wrote that particular erstwhile prospect a real "come to Jesus" note. So, what’s become of common decency in business? Don’t these people realize that their poor behavior reflects badly on their firm and its reputation? In the final analysis, we’re all only one or two degrees of separation away from being customers or consumers of one another’s products and services. 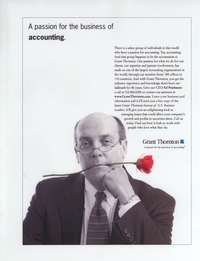 I like to think that if the roles were reversed, I’d treat fellow businesspeople with a little more respect.